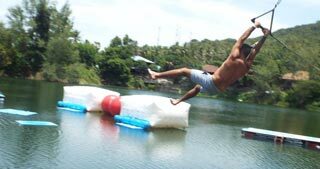 This tourist paradise has more than two dozen beaches spread around the island that caters to just about every kind of visitor - from the lowest budget backpackers to the high-end luxury tourist. There are beaches where you can spend your entire holiday "24/7" partying, and others where you can relax and enjoy the peace and tranquillity on one of the many isolated, picturesque beaches. With a few exceptions, the next beach along can usually be reached by a short motorbike or tuk-tuk journey and visitors can spend every day of their holidays on a different beach. To assist you in choosing what is right for you, here is our summary of the main beaches and groups of beaches around the island. We start from the southernmost beach and move around the island in a clockwise direction. *SOUTH* Haad Leela (Haad Sarikantang) - Ideal for those wishing the best of both worlds - partying and peaceful seclusion. Located at the very southern tip of the island, it's quite secluded and is a good beach to stay if you want to get away from the noise and partying at nearby Haad Rin. Swimming is not possible at low tide, and being on the southern tip, the wind can sometimes blow pretty hard. It has a long white beach which is quite rocky and the coral reef that stretches along the southern coast starts here. There are a few old resorts, and also several new ones located among the palm trees. The advantage here is that it is only a 15-minute walk to the town centre. 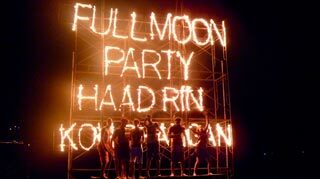 Haad Rin - If partying is your thing, go no further. Had Rin is actually two beaches - Haad Noi and Haad Nok and once regarded as the best beaches on the island, with their long wide stretches of white sand. However, the inundation of revellers looking to party "24/7" has somewhat degraded its "number one" ranking in recent years. Haad Rin Noi, also known as "Sunset Beach", is on the western side, and is famous for its beautiful sunsets. This beach almost disappears at high tide, and at certain times of the year, swimming is not possible. On the eastern side, Haad Rin Nok stretches for over one kilometre of fine white sand and is an excellent place for a swim, whatever the tide or the time of year. 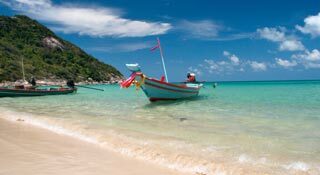 It's also the port where all the boats and ferries arrive from the mainland, so it is the first beach you will see when you arrive in Koh Phangan. Haad Rin Nok has gained a reputation as the most popular partying beach in Thailand, and is host to the famous full moon parties which attract over 10,000 visitors, and as many as 30,000 at New Year. Over the past 30 years, a huge number of nightclubs, bars, restaurants, hotels, guesthouses and bungalows have sprung up along the entire length of the beach. It's THE place for sun-soaked beaches by day, wild parties by night. *WEST* Ao Ban Tai and Ao Ban Khai - A wide range of accommodation which is suitable for families, as well as those who are happy to take a taxi ride to go partying. Going westwards, but still in the south-west corner, these two long beaches provide beautiful views, especially at sunset, and you can see Koh Samui and the marine park in the distance. Much quieter than the partying beach of Haad Rin, these beaches are still close enough to offer a good compromise for those who wish to party by night, and get away from it all during the daytime. 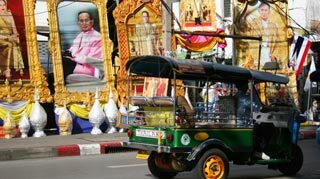 It is a relatively short journey by Songtaew or motorbike taxi, and if you're feeling energetic, you can walk there in 1-2 hours. 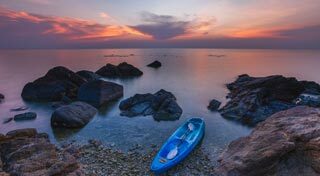 Both these beaches offer spectacular sunset views, and at Ban Tai, which is a fishing village, you can rent a boat to go fishing or take a trip around the island. Ban Khai is the start of a long beach that runs all the way to Thing Sala, and has white sand and a coral reef which is good for snorkelling. There are a number of bungalows with rooms at budget prices as well as a few more upmarket choices with A/C and swimming pools. At certain times of the year, low tides mean that swimming and snorkelling are not possible. Ao Bang Charu - A long beach with spectacular sunsets and good for snorkelling. 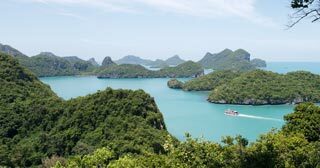 Moving northwards, this long beach stretches from Ban Kai to Thong Sala, and it is still close enough to the 'action' to attract visitors that prefer a slower pace of life during the day, with its unspoilt sandy beaches. As with other western oriented beaches, it has lovely sunset views over Koh Samui and is a good place for snorkelling. But again, during the low tidal season, swimming and snorkelling are not possible. Nai wok Bay and Plaay Laem Bay - Beaches, resorts, bars on a hill and boating. Two long beaches, halfway up the western side of the island, contain a number of resorts and swimming is possible for most of the year. There are also several bars located on the hill, which provide a little entertainment after sundown. You can also rent Kayaks and Catamarans from here. Woktum Bay - A rocky beach with minimal accommodation. Just north of Nai Wok beach, this quiet beach only has a few scattered bungalows for rent, probably because as it has a rocky beach and swimming is only possible during the high tide season of September to April. Hin Kong - Undeveloped, peaceful area, suitable for long-stayers. Continuing up the west coast, the next beach is Hin Kong, 2km long and largely undeveloped. There are a few bungalows and many houses for rent but little to attract tourists, as the beach is quite rocky and the swimming is not great. However, it does have spectacular sunsets and is a very peaceful place for those wishing to rent a cheap house or bungalow and stay for longer periods. Sri Thanu - A fishing village with good tourist infrastructure. 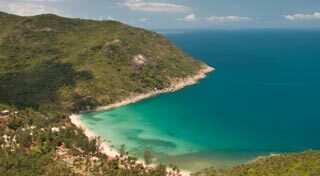 Next up the coast from Hin Kong is the popular beach of Sri Thanu. 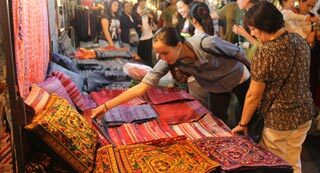 There is an established fishing village with many bungalows and a considerable tourist infrastructure, such as internet, food stalls, bars and fresh markets. Most importantly, you can swim all the year round. Haad Chao Phao - Snorkel and swim all year round, and several yoga schools nearby. Just north of Sri Thanu is a lovely curved beach with white sand next to Laem Son Lake. Reckoned to be one of the best places to go snorkelling on the island. You can also swim all the year round, and there are the usual breathtaking sunset views. 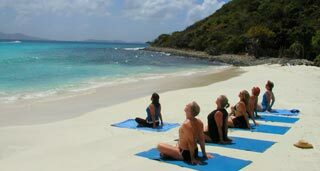 There are also several yoga schools based around here and for those who want a bit of nightlife, there are a few bars with organised parties around full moon. Haad Yao (West Coast) - One of the finest beaches in Thailand has a broad range of accommodation and suitable for singles, couples and families. This wide, 1km long, lovely pristine beach on the north-western coast of Koh Pha Ngan, may well have overtaken the party-mad Haad Yin beach as the most beautiful beach on the island - quite possibly the whole of Thailand. There is accommodation to suit all pockets, from budget rooms and bungalows with basic facilities, to fully-fledged 'Samui-style' resorts, with swimming pools, and 3 star, A/C accommodation and the usual resort facilities. There are also restaurants and bars scattered along the beach which provides all year around swimming and is suitable for beach activities, water sports, including snorkelling, and beach parties. Mae Haad and Haad Salad - Two lovely beaches, with good tourist infrastructure and a laid-back atmosphere. These two nice beaches, just north of Haad Yao, in the north-west corner of the island, are similar to Haad Yao in terms of fine white sands and the availability of a range accommodation, restaurants, shops, etc. 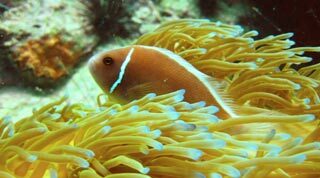 There are plenty of fish in the sea, and again, it's a great area for snorkelling enthusiasts. Haad Mae Had is a lovely secluded beach, opposite the tiny island of Koh Ma which you can reach on foot at low tide. In spite of the number of tourists, there is still a laid back, relaxed atmosphere in this area, with just a little nightlife, including the famous Reggae Bar on Haad Salad. *NORTH* Chaloklum - A working fishing village with a long beach and a good range of accommodation and restaurants. Half way along the north coast of the island is an active fishing village where the fishing boats fish for small squid. The beach is over 2.5km in length, and it is a good place for swimming and body surfing when the tide is high. There is a range of accommodation and restaurants, and a popular pastime is to relax over a beer and observe the colourful fishing boats moored up at the nearby pier. 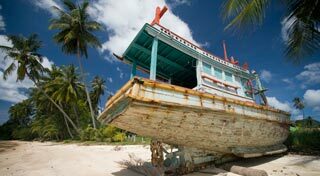 Haad Khuat (Bottle Beach) - A beautiful isolated beach, which is only accessible by jungle trek or boat. Just a short walk in an easterly direction along the northern coast through a bit of jungle terrain will bring you to Haad Khuat, which translates as "Bottle Beach". If you don't fancy a jungle walk, you can also take a short boat ride to this beach from Chaloklum. It's a gorgeous beach but does not offer much in the way of sunsets or sunrises. *EAST* Thong Nai Pan Noi & Thong Nai Pan Yai - These twin beaches are the most popular on the eastern coast and are suitable for everyone. Two coves form a scenic double bay and are the most popular beaches on the east coast. If you go by road, please be careful as the road is a little treacherous and is mostly a winding, steep dirt track. The safer and more relaxed alternative is to take a slow boat from Haad Rin. Both beaches have beautiful white sand, but the northerly beach of Thong Nai Pan Noi is probably the better of the two, as it has the deepest water of all the beaches on Koh Phangan. So swimming, snorkelling and body surfing are possible all the round. Fast becoming serious tourist area, there are many recently built bungalows providing a good range of accommodation, and there's a small village nearby with shops, restaurants and bars for those who like a bit of nightlife. From its name "Yai" (which means Big in English) you can discern that the southerly beach is bigger, but is less busy than its northerly neighbour. There are a few bungalows and restaurants on the beach, but dense jungle surrounds the beach and there is no village. Haad Sadet - Undeveloped beach with little choice in accommodation but with fantastic views. 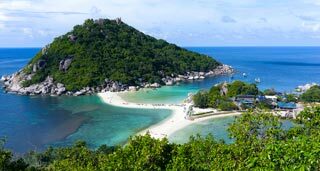 A little south of the twin Thong Nai Pan beaches is a small and pretty beach with white sand and soft shingle, in a sheltered location. A new road accesses the beach, but you will have to leave your vehicle (including motorbikes) in the car park and take a five-minute walk. Quite isolated, one of the plusses here is there is no noise from bikes and scooters. There is one well-reviewed restaurant, and a somewhat run-down bungalow resort, which still rents out cheap, clean and tidy rooms with amazing views. 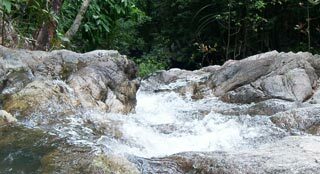 A good choice for those travelling on a low budget and wish to enjoy the peace and tranquillity that this location offers Had Thong Lang - Totally deserted beach which can only be accessed by sea or by very rough jungle trail. Had Thong Lang, which means "Golden Deserted Beach" is exactly as described. Here you will find a shallow coral bay and a coral reef which becomes a lovely lagoon during the high tide season. The beautiful beach is completely deserted but there are no picturesque sunsets or sunrises. 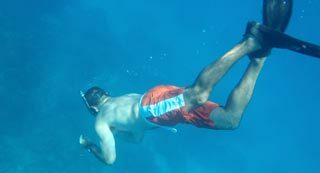 There is excellent snorkelling at high tide, but be careful not to damage the reef. With no facilities, it is only suitable as a day trip for those seeking the ultimate desert island type location. You will need to hire a long tail boat from Chaloklum fishing village or take a motorbike taxi along a rough dirt road, which must be carefully navigated. Haad Yao (East Coast) - Isolated beach with good all year round swimming but difficult to access. On the south-east side of the island, is a lovely white sandy cove, with no coral reef, so swimming is possible all year round. It is behind a rocky headland, Laem Nokrong, and is only accessible by sea or by foot via a mountain path - a trek of about 8km from Haad Rim. There are only a couple of small bungalow resorts here, and if you are just visiting for the day, bear in mind that the weather is rougher on the east coast and sometimes the boats cannot run. Haad Thian, Haad Wai Nam, Haad Yuan, and Haad Nam Tok - Four nice beaches with all year round swimming, and popular with long stayers. Located on the south-east side of the island, these four small white sandy beaches run down the coast, one after the other - each one about ½km from the next. All year around swimming is possible from all four of them. These islands can be reached on foot, via an arduous mountain trek from Haad Rin, or more conveniently, by taxi-boat. They have become popular beaches for those wishing to stay for a few weeks or longer, as regular tourists may get caught out on rough weather days when the taxi-boats cannot run. Haad Yuan - A very quiet beach, only a short boat ride from Haad Rin, not suitable for the physically challenged. 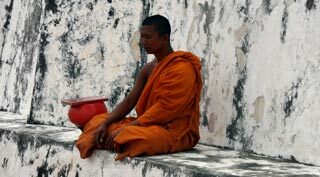 Haad Yuan, is in the south-east of the island, some three kilometres north of Had Rin. This pretty beach provides a much quieter experience for those tourists who may have already spent a week or so in Had Rin and are looking for a more peaceful atmosphere and want to get away from it all. There are a number of bungalows for rent but the accommodation would not be suitable for the physically challenged as it can be a tricky walk over rocks and rickety walkways to get to the beach. There are a few restaurants, but nights are very quiet, except for the occasional party on weekends. Swimming is not always possible in rough weather. The beach is usually reached by taxi-boat from Haad Rin, and there is a long rough track through the jungle, which can only be navigated by 4x4.